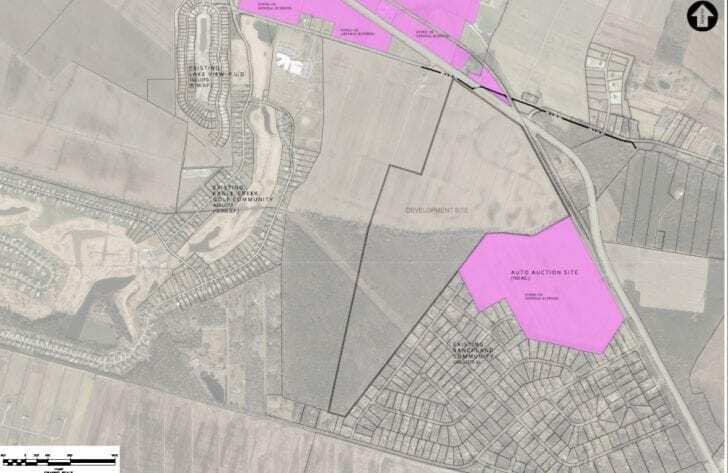 The majority of Currituck County’s Board of Commissioners dismissed the recommendation of the county’s planning department Monday, voting 6-1 to approve the rezoning of almost 230 acres in Moyock for a 513-unit residential community. Justin Old and Mark Bissell of Allied Properties in Kitty Hawk hope to build an upscale, urban-style streetscape on the property, which would include single-family homes and townhouses, 85 acres of green space and a multi-use path spanning the entire site. The plan includes 22,000 square feet of limited commercial space on the lower level of some townhouses, a club house and village green for community events, and sidewalks and landscaping along both sides of all streets. The developers envision a community that promotes an active lifestyle and a sense of community, making it a good fit for the vision of Currituck Station, the county’s plan for several hundred acres two miles up the road. 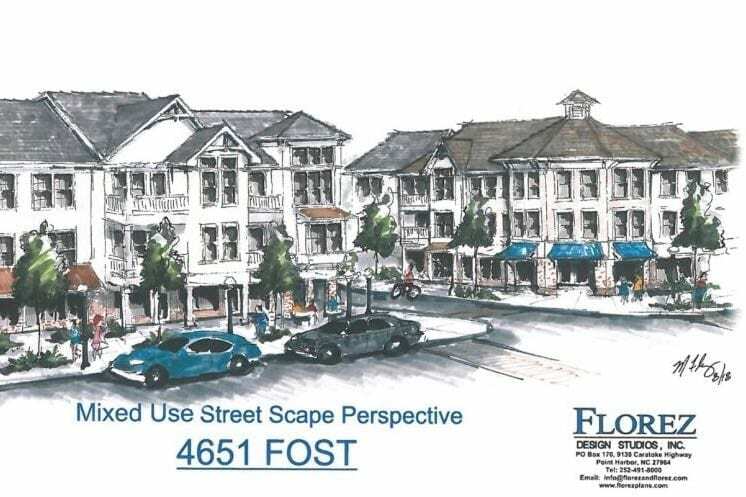 The location of the new project, currently referred to as the Fost tract after its owners, is one of the reasons the county’s Planning Department recommended the zoning request be denied. 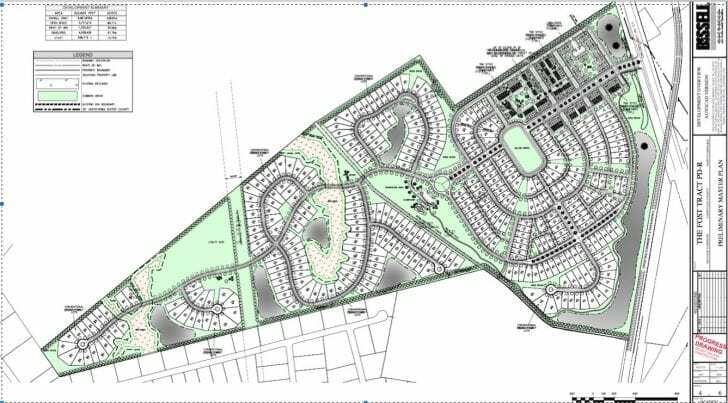 “Our big concern was just having that much density that far away from our existing infrastructure,” Currituck County Planning Director Laurie LoCicero said Monday, before the commissioner’s vote on the project. The community will face N.C. 168, or Carotoke Highway, next to Ranchland subdivision and close to Eagle Creek subdivision. In Ranchland, to the east of the Fost tract, the lots average almost an acre and a half, with a density of .58 housing units per acre, LoCicero said. Lots in the Fost tract will average about a third of an acre, with a density of 2.25 units per acre. “It creates a level of inconsistency when you have much smaller lots beside much larger lots,” LoCicero said, adding that the difference may have a negative impact on the adjacent neighbors. In addition, unlike Currituck Station, the site of the proposed project lacks any existing infrastructure, and the developers won’t be able to tie into the county’s wastewater system, LoCicero said. The developers plan to build an onsite sewage treatment facility. Because of the project’s relative high density and lack of infrastructure, it doesn’t meet the requirements of the county’s 2006 land use plan, or the county’s Moyock Small Area Plan, LoCicero said. Another major concern of the planning staff is stormwater management. The subdivision is planned for a low-lying area that has a history of flooding, and if the developers’ storm water management plans aren’t carried out, the project may make flooding worse for adjoining neighborhoods, LoCicero said. However, Mark Bissell, an engineer for the development, said the developers are willing to build retention ponds and clean out the drainage system on the property. In addition, with permission of the landowners, the developers will also make improvements to Roland canal, the Survey Road ditch, and the ditch shared by the Fost property and Ranchland subdivision. County engineer Eric Weatherly reviewed the developer’s storm water plans during Monday’s meeting, and said that the developers should plan to deal with stormwater from a 500-year flood event, rather than the traditional 100-year flood requirement. 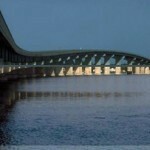 In other words, the plan should accommodate the worst possible flooding event that might happen over a span of 500 years, rather than the worst anticipated flood over a span of 100 years. The county’s Planning Board recommended the Board of Commissioners approve the project, based on its determination that the plan did meet the requirements of both the land use plan and the small area plan. The planning board also noted that the developers’ promised improvement to the storm water system would benefit nearby property owners and the county as a whole by saving the county the cost of remedying the flooding problems of nearby properties. The motion to approve the rezoning permit, made by Commissioner Kevin McCord, included the stipulation that the promised storm water improvements be put in writing by the developers. Commissioner Kitty Etheridge cast the sole “no” vote. Several people spoke out in favor of approving the development during Monday’s meeting, including the tract’s landowners, Iris O’Conner and Mike and Sandy Fost. Sandy Fost told commissioners that the property has been her family for a hundred years, and that as farmland, it provided for several generations. However, it’s become tougher for family farms to generate a profit, and the land is now less valuable as farmland, she said. “As you know, we wanted to develop this property for solar use, but we abandoned our pursuit of solar contracts when the county banned solar projects,” Fost told the board. “So when my husband, sister and I were approached by multiple developers recently, we decided that the best possible way to use the land to provide for our families was to sell it,” she added. Once complete, the plan is expected to result in 241 new students in Currituck County schools — 128 elementary students, 41 middle school students and 72 high school students. I live in a Ranchland and have lived here over 30 years. My mom and Dad was one of the first to buy a lot here. The flooding has gotten worse over the years and common sense I can probably be pretty close on why the flooding has gotten worse. People over the years that have bought a lot had to build up the lot to county codes which made their lots higher than mine so if you have surrounding lots higher than yours it puts my lot in the middle for all water run offs. I got pics where 136 Bison Dr all the way to Longhorn Dr. flooded so bad you couldn’t drive thru it water was up to the headlights of vehicles. It seems to be getting worse. I stand by Commissioner Kevin McCord on the stipulations on storm water improvements. We have been trying for years to get the county to improve our drainage problem with no success. Ms. Land is right. I do not live in the area in question but am familiar with the Ranchland sub. Commisioners who voted for this have really thrown a bunch of folks underwater. The concept is great and something that a lot of people would want to live in but it is in a very bad location. The lack of other than vehicular access to everything else in Moyock is just plain dumb. But hey, lets just how many people we can cram into Moyock.